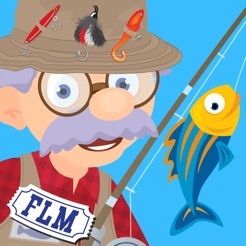 Let’s go on a fishing adventure with Grandpa! Grab some gear, play underwater games, choose a lure, cast a line, hook and reel in a fish, and add new fish to your collection! 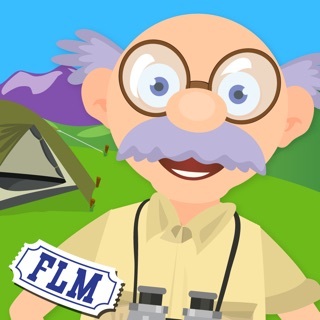 Grandpa needs your help counting fish, spotting differences, identifying fish, solving puzzles and mazes, and more. Plus, watch videos of real anglers in action. Ages 3-6. 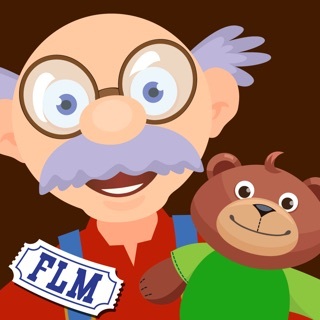 Kids love Fishing With Grandpa because they go on an adventure full of fun and surprises. 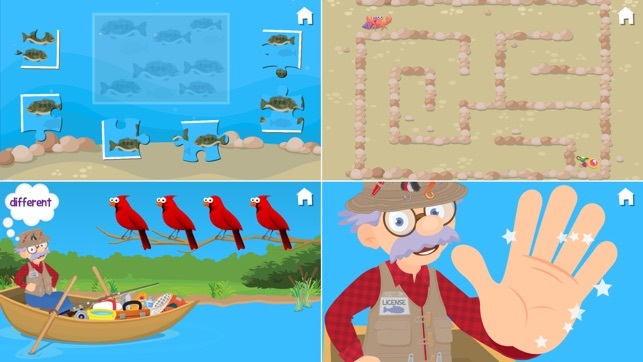 Parents and teachers love Fishing With Grandpa because it covers a broad curriculum of basic skills education in a real-world context. 1. Find the Gear. Which one is the anchor? 2. Fish Groups. Which group has 5? 3. Crabby Mazes. 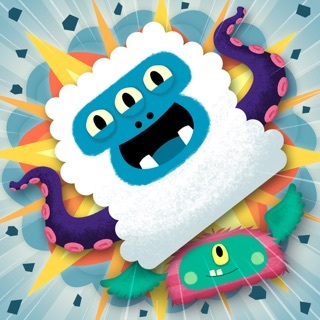 Help the crab get to the treasure! 4. Fish Puzzles. Which fish are in these waters? 5. Spot the Difference. Which bird is different? 6. Fish Colors. Touch all the green fish! 7. 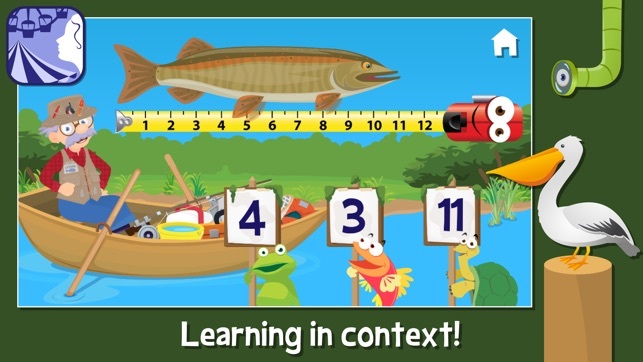 Measure the Fish! How long is this fish? 1. Choose a Lure. Which lure should we use? 2. Cast line / Hook Fish. Move slowly… don’t scare them! 3. Reel it in! He’s almost in! 5. 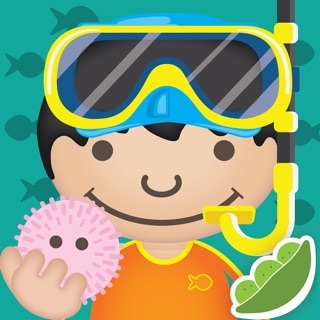 Add the fish to your collection! Including how lures are used, what is a bobber, reeling in, earthworms, examining a lure, fly lures. 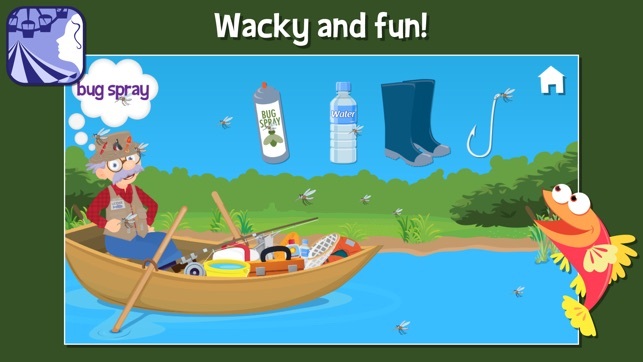 Fishing vocabulary: lure, bobber, reel, hook, bait, line, life vest, anchor, oar, and more. 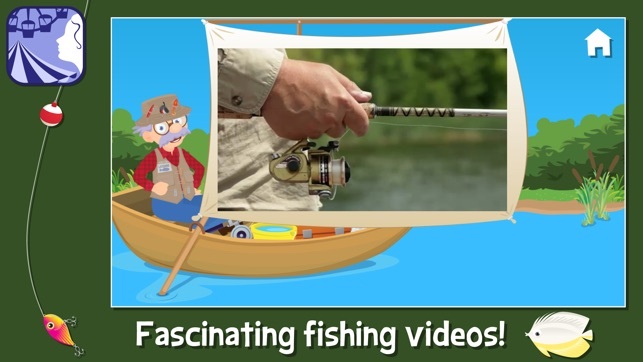 Fishing With Grandpa includes colorful graphics, professional-quality music, sound effects, and voices. 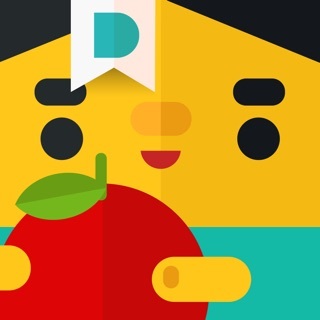 It was developed by an Educational Psychologist and parents and tested by children. 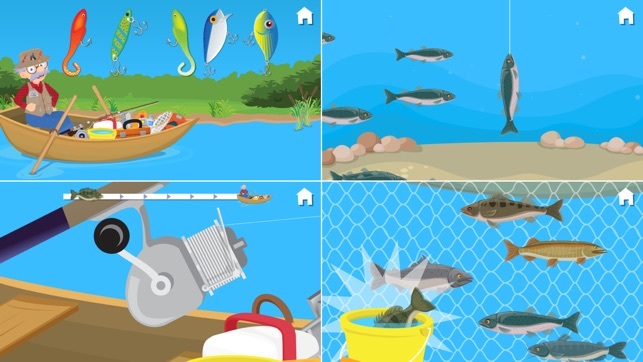 My kids loves these apps, we’ve had the Grandma’s Garden for a few years and I recently downloaded Fishing with Grandpa. It works perfectly on my iPad, but there is no sounds on my iPhone...am I doing something wrong? 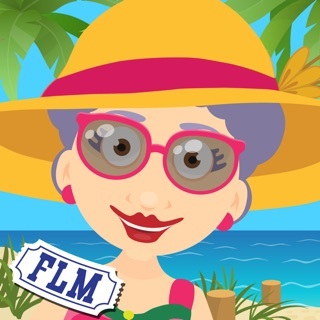 My granddaughters LOVE this app! What kid wouldn't love to go fishing with grandpa! Now they want ME to take them fishing! Guess I'll have to buy a boat 😀. 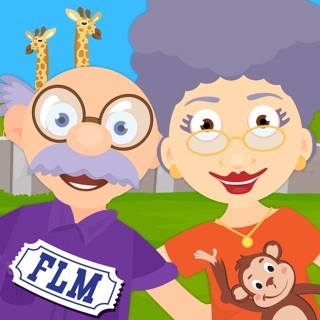 Seriously, a great app that introduces children to one of our great pastimes, and provides fun and education along the way. 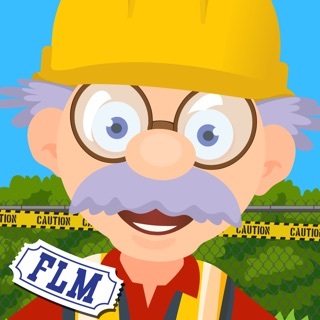 Love the real video clips- just as in Grandpa's Workshop (another fine app from Fairlady Media), these videos add just the right amount of realism to enhance the learning process. 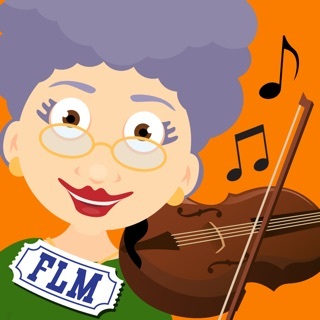 © Copyright 2015, Fairlady Media, Inc.